The Continental Series from Concord American Flagpole combines heavy-duty aluminum flagpoles in 20' to 80' mounting heights with the highest quality hardware available to the industry today. These flagpoles meet the most stringent architectural standards and are certain to enhance the landscape of any business or industrial property. Lifetime WarrantyConcord American Flagpole warrants its aluminum flagpole shafts for their LIFETIME. In addition to the standard colors listed for each flagpole, we offer a wide variety of other colors. Click Here to see other available color choices. Estate flagpoles with a base diameter of 4" or 5" can be ordered with a Shoe Base mounting for an additional $200. 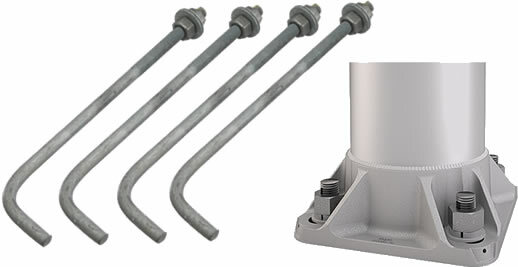 Each Shoe Base pole comes with 4 galvanized anchor bolts, washers and nuts. If you wish to modify this flagpole with other features like a double pulley revolving truck assembly, eagle, different ball finial, etc. Please call us to discuss this. Some changes will have no additional charge but others might. We will work with you on any changes to the standard pole you wish to make.